Having cellulite is one of the main reasons why many adult females avoid wearing bikinis and shorts. Their self-esteem and self-confidence are greatly affected since they always end up covering their thighs with pants. Are you one of them? Don’t worry. You are not alone. Almost 90% of adult females have cellulite. While many temporary treatments have flooded the market, such as creams, lotions, and rollers, none seemed to be really effective in eliminating cellulite. However, Dr. Frank Agullo at Southwest Plastic Surgery of El Paso, TX has great news for you. The award winning Med Spa at Southwest Plastic Surgery is proud to introduce a cutting-edge treatment that is designed to specifically target cellulite. Cellfina, which is an FDA-cleared treatment, is a minimally invasive procedure that can significantly reduce the presence of cellulite for as long as two years. 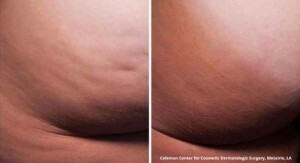 In fact, it’s the longest FDA-approved duration for cellulite treatment. Cellfina works by targeting the primary cause of cellulite, which are likened to rubber bands that are found on the outer layers of your skin. These bands are tight and it causes the “dimpling” that you see in your thighs and buttocks. When these bands are “cut”, the tension will be gone and the skin will return to its normal appearance, which is free from cellulite and dimples. In as short as three days, you will immediately see encouraging results as the skin improves its appearance. You have probably tried other kinds of cellulite treatments before, but all of these past treatments probably missed the mark. For instance, cellulite creams became popular but they didn’t have long-lasting results. There’s also no scientific evidence that really proves that these creams are effective. In fact, some may even find these cellulite creams to be harmful as it forces your blood vessels to narrow. There are even reported cases where patients had an allergic reaction. Meanwhile, liposuction, which is an invasive procedure, seemed to be the last option for some people. What you should know is that liposuction does not really target the cellulite, but only the deep fat under the skin. According to the American Academy of Dermatology, liposuction may actually worsen the appearance of the cellulite on your skin. The main difference between Cellfina and these treatments is that Cellfina really targets the root cause of cellulite, which makes it the better option in the long run. Aside from being minimally invasive, it shows long-lasting results. Cellfina works by making sure that the real cause of cellulite is taken care of. Under the top layer of your skin are connective bands that are found along the layer of fat. These bands are the reason why your skin has dimples since these tight bands pull your skin downwards. When the tension of these bands is released, your skin will certainly improve its appearance in as little as three days. What makes Cellfina great is that it’s minimally invasive. There’s no need for an operating room or general anesthesia. The procedure just makes use of a very small needle-sized device to eliminate the bands found on the top layer of the skin. If you have a busy schedule, Cellfina is perfect for you. You only have to attend a one-time session that can be completed in just 45 minutes. There’s also limited downtime for the treatment. Initially, a few patients do experience tenderness and a little soreness, but these side effects quickly subside in time. In a pivotal study, there were no serious or adverse side effects associated with the Cellfina treatment. The common side effects include soreness, tenderness, and bruising. However, after three days from the treatment, patients in the study rated their pain as very minimal. They were asked to rate the pain from 0 to 10 with 10 being the most painful. The score they gave is 2.7 just after three days. It’s also good to know that more than 90% of the patients are free from bruising in just four weeks. If cellulite has been plaguing your thighs and buttocks for years, then Cellfina is perfect for you. Did you know that Cellfina is not widely available in the US? You’ll be part of a very small group of patients who gets to enjoy the benefits of Cellfina. Before you proceed through with your consultation, we do have to inform you that the Cellfina System is primarily designed and created to eliminate cellulite found in thighs and buttocks of adult females. The Cellfina System can only be administered by a qualified physician. With the many advantages of the Cellfina System, it may soon become the standard cutting-edge solution to treating cellulite. With results lasting up to two years, no wonder many people are curious about this breakthrough treatment. Contact Southwest Plastic Surgery, one of the country’s top plastic surgery practice, to learn more about this breakthrough cellulite treatment. We serve El Paso, West Texas, New Mexico, and Northern Mexico (Ciudad Juarez and Chihuahua). See what all the buzz is about. Schedule a consultation today!